“He goes on about he’s beaten this person, he’s beaten that person,” says Tyson Fury 27-0 (19 KO’s), who’ll challenge Deontay Wilder 40-0 (39 KO’s) in a Showtime Pay-Per-View main event December 1, at Staples Center in Los Angeles. As predicted the verbal back-and-forth, mental warfare, leading up to the biggest heavyweight bout of the year, featuring two undefeated champions, has been nothing short of entertaining. Wilder, the WBC heavyweight champion and Fury, the last recognized Lineal heavyweight champion aim to battle for heavyweight supremacy this weekend. The unified WBA, IBF and WBO heavyweight champion Anthony Joshua, will certainly watch the two combatants intently. If you ask Fury, it appears he doesn’t care if Joshua is watching and doesn’t think much of Joshua’s current standing as unified heavyweight champion. Fury has plenty of venom for Joshua as well. Wilder by all accounts is an emotional fighter; his feelings fueled from past experiences in life inspires the rage he unleashes inside the ring. He described in an interview leading up to the fight the desire to share his pain with Fury, to inflict as much damage as possible and that Fury will understand his story through absorbing this pain. “As fighters, people don’t understand how much it takes to break your body down days, weeks and months at a time. As a fighter, you’re forced to absorb pain and inflict punishment on your body every day you wake up,” said Wilder. The damage inflicted inside the ring. That’s what it ultimately boils down to. But often overlooked is the psychological war leading up to the fight and the mental warfare once the physical battle begins. 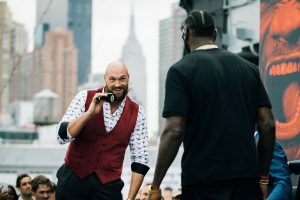 Fury displayed his mental prowess over opponents in the past and even across the promotional tour with Wilder displayed a measure of command many observers believe provides him advantage heading into the fight this weekend. “He knows he can’t win and it’s clear for everyone to see now. He’s a very nervous character and by the looks of it he doesn’t want to fight. He talks a good game but he talks nonsense really,” said Fury. Come fight night we’ll find out if what Fury states holds any weight. Both fighters overcame tremendous personal and professional obstacles and adversity to reach the pinnacle of the sport and to arrive at this special moment upon us. From a professional standpoint tough heavyweight challenger Luis Ortiz hurt Wilder badly during the seventh round of their March 3 fight at Barclays Center in Brooklyn, but couldn’t finish the job. Wilder withstood the onslaught and roared back to floor Ortiz twice more in the 10th round, stopping the Cuban southpaw to retain his title in Rocky-esque fashion. Former cruiserweight champion Steve Cunningham knocked down Fury in the second round of their March 2013 battle in The Theater at Madison Square Garden. Fury overcame that difficulty to knock out Cunningham in the seventh round. From a personal standpoint, the hurdles each man overcame and still battle to this day are well documented. Both guys’ endured tough upbringings, Fury has battled depression, mental illness and drug abuse most recently. Wilder cares for his daughter with special needs and that’s an everyday battle. As far as the trash talk and mental tactics, Wilder welcomes it. But will this be his undoing? Wilder acknowledges Fury’s mental toughness and how that can be a factor. Can Wilder implement the right game-plan, stay focused and ultimately win the fight? If Wilder is too “Wild” in his approach and too focused primarily on the big one-punch knock-out and head hunting, he will lose. For Fury if he loses focus for one moment, it can all end due to Wilder’s punching power. Fury must not underestimate Wilder’s ability to adapt; he’s underrated with that aspect. Fury is a nightmarish match-up, as is Wilder, which is what makes this bout so intriguing. Can Wilder deal with someone bigger and taller than him? Plus Fury is awkward, has long arms, uncanny rhythm and reflexes, great boxing instinct, high boxing intellect and strong mental strength – as does Wilder. These fighters mirror many traits but provide different versions from a stylistic standpoint. Again, this may boil down to who can preserve through the mental war waging in the ring come fight night. “That’s why I don’t really get excited when I knock somebody out, because I’ve already fought that person multiple times in my mind before ever stepping into the ring,” said Wilder in an interview leading up to Saturday. For Fury, this is the road to redemption, to claiming a world title for the first time since losing his belts due to circumstances outside the ring. This is his opportunity, in perhaps his biggest test professionally, to show he is the Gypsy King and the heavyweight king. We’ll see which prediction holds true.